I know I have been mentioning Little Penang Cafe in most of my KLCC posts and we finally made it there this week. We got there early before the lunch crowd came and managed to get a nice table near the windows. All of us ordered different sets as it was easier to eat, more economical and gave us different varieties to try from. 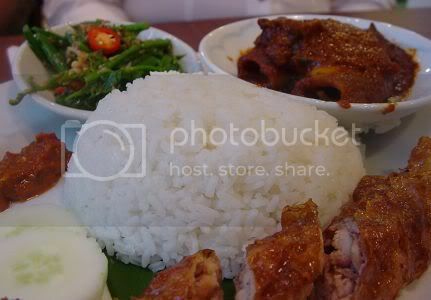 I had the set with a dry prawn curry, kerabu paku pakis (Malay for fern shoot salad) and lor bak. The lor bak here is actually made from chicken meat as everything is halal here. Splashie Boy had the Tau Yue (Dark Soya Sauce) Chicken with hard boil egg, ju hoo char (Shredded Jicama Bean and Cuttlefish) and sambal petai prawn (Stinky bean prawn sambal). You can choose between ju hoo char or kerabu paku pakis for your vegetables. 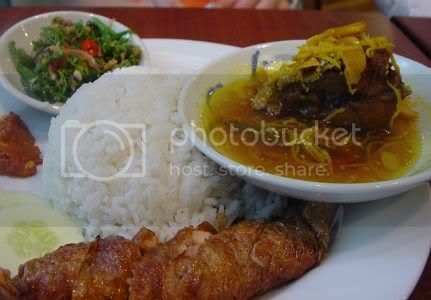 Robyn had the Acar Fish, Kerabu Paku Pakis and the lor bak set. She thoroughly enjoyed her Acar Fish with the sourish sauce. Mau took the sotong curry set with kerabu paku pakis and lor bak. She was regaling tales for us on traditional Nyonya dishes including ones I have never heard of where you cook this particular fish with lots of bones in an assam or curry sauce, then drain it and deep fry it. It becomes so crispy that you can eat the whole fish with it's bones and the pre-cooking in the curry gives it lots of flavour. Sounds interesting and something to try out. I must be really into Nyonya food nowadays and I plan to cook some (hopefully) soon as I just got the New Mrs. Lee and Mrs. Leong cookbooks. The place is packed during lunch time and if you come later, you may have to wait a while for a table but service is brisk once you have placed your orders. Great food and good value. I reckon they will definitely give Madam Kwans a run for their money during lunch hours. ooohh i walked past this new outlet of theirs the other day and was so impressed by the decor. love the colours and design, which looks much better than the one at the curve (which funnily enough somehow gives me the impression that i'm in a tv drama set). here the 60's (?) style doesn't have that tacky or cheesy feel at all. Will try to drop by when I'm back in KL next month. boo, My family recently tried the branch @ The Curve and felt that their standards have dropped compared to the Starhill days. Perhaps the food quality at KLCC's branch is better. Looks good from your pictures! Wah! Penang Nonya food. Everything looks so good. Can't wait to see your Nonya dishes! I guess I'll join you too. Coincidentally, Mom and I had been planning to cook some Nonya delights together later on... great stuff! 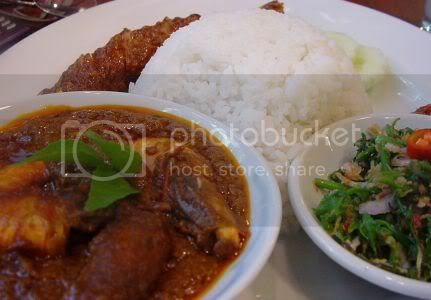 I went to the Little Penang Cafe @ KLCC early last week. My friend and I wanted to try the lunch sets, but as both of us don't like fern shoots and petai, we ordered from the ala carte menu. We had nasi lemak, char kway teow, rojak and otak2. The dishes tasted quite good. Sambal ikan bilis and tenggiri for nasi lemak was nice. Char kway teow tasted much better than Mdm. Kwan's (and cheaper too), kuah rojak texture was right, otak2 was soft. I thought the dishes at this outlet tasted better than the Megamall outlet. q - I like the windows. I could look out and spy people I knew and wave to them. shawn - no problems. Used already. lavamama - the owner was there. We chatted a bit with him. Been ages since I ate at the other outlets though as I always try new things in the malls. rabbit - I hope they turn out okay as I ain't got any Nyonya blood in me! skyjuice - wow, the food sounds good. Can go another time too! Little Penang is in KLCC?? I work here and I don't even know that! Must check it out..
lin - new development! Hope you enjoy the food there. firstly...brillant blog, shld have known abt ur blog b4 i travelled to KL last week haha! 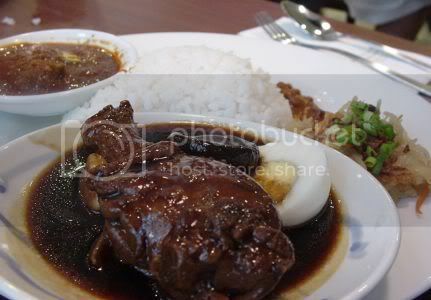 went to Lil' Penang Cafe and i must say the food is YUMMY! i was really really surprised by the food quality there. the kway teow oooo... and the laksa as well..
Can anyone get me a copy of the menu or an email address for Little Penang Kafe? I had lunch there 2 weeks ago and really liked the Pie Tee and Kari Hantu Set and would like to try it at home. Alas... another place which has gone DOWN the gutters! Truly dissapointing, and blah food, topped off with BAD customer service :-( So slow and staff who were simply indifferent. Anyway, on a positive note ... we didn't get food poisoning ;-) And HAPPY NEW YEAR to you dear Masak-Masak!!!! LOUSY WAITER n LOUSY SERVICE..
Me and my gf went there for dinner during new year eve 2011 with our shopping goods. First we were seated outside with a table of 4 (2+2) which they split it into 2 tables. We got no place to put our things and changed to inside which is also a table of 4 (2+2) with build-in chairs. Right after we placed our order and asked the waitress to clean the table for us. A waiter came by and told us that we cannot occupied a table of 4 because we were 2 persons. After a small debate with him, my gf said that we want to cancel order, he pop out a phase "CANCEL, CANCEL LA!!" Wah, what kind of manner is this to service his customer and who he think he is? I can understand the restaurant want to maximize the customer count during peak hours. He can split the 2+2 table in 2 since they can combine table of 2 into 4 or more. Moreover there were enough empty tables for others. Just been to that place. Food not that good. The Sambal Petai really pitiful. Mostly just sambal. Petai and the prawns duno gone where.